BRUSSELS - A Syrian journalist was killed and a cameraman injured in a shelling by Syrian government forces on October 29 in Damascus province. The International Federation of Journalists (IFJ) has mourned the death of the journalist and called on all sides to recognize the importance of safety for those covering conflicts. Qays al-Qadi, who was in his 20s, worked for Al-Jisr, an Istanbul-based TV channel. His colleague, cameraman Omar Damashky, was injured and taken to hospital following the attack. According to media reports, Qays al-Qadi had a press card around his neck when he was struck. The journalist was a bureau chief of Al-Jisr covering the situation in Eastern Ghouta, which is held by opposition forces. 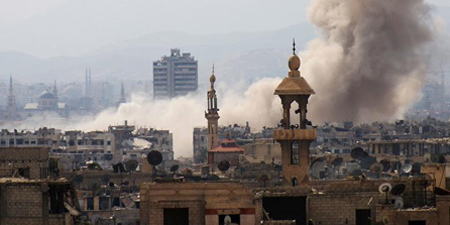 This area located in the east of Damascus had been heavily targeted by President Assad’s forces for a week. Ten other civilians were killed in the same attack.